Today, the American Automobile Association (AAA) announced its top cars for 2006 in 13 distinct categories and selected the Jaguar XJ8L as its top pick in the $50,000+ category. "The XJ8L has long distinguished itself from other luxury cars by offering outstanding performance, classic design and true luxury in one sleek sedan," said Mike O'Driscoll, president, Jaguar North America. "An endorsement from a team of trusted third-party experts, like AAA, is what Jaguar strives for when developing world-class vehicles." Every year, AAA takes a comprehensive look at more than 200 vehicles and judges them according to many criteria, including ride, performance, braking, handling, passenger and cargo space, value, and fuel economy. “Consumers in the market for a luxury sedan with excellent performance, handling agility and interior refinement will be impressed as AAA was with the Jaguar XJ8L sedan,” says John Nielsen, director of AAA’s Approved Auto Repair and Car Buying Program. The XJ sedan is the bedrock on which the Jaguar of today is based. Seven generations of XJ – from the very first XJ6 unveiled by Sir William Lyons in 1968, to the all-new model that made its public debut in Spring 2003 as a 2004 model – have taken the mantle of the definitive Jaguar sedan. 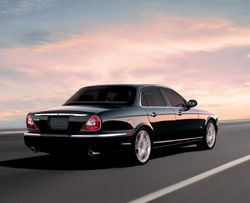 For 2006, Jaguar continues to hone and enhance its complete XJ sedan line-up. Acoustic laminated side glass is fitted to further minimize the intrusion of external noise into the cabin, while a state-of-the-art tire pressure monitoring system detects pressure drops in all five wheels, including the spare. A new braking system, with bigger diameter rotors and stronger calipers further improves on the XJ's already impressive braking performance.